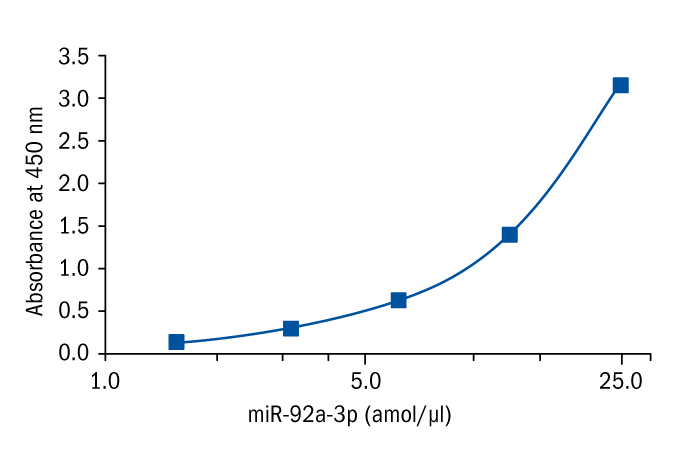 miR-92a belongs to miR-17-92 cluster and was identified as a biomarker for many human cancers such as pancreatic cancer, gastric cancer, prostate cancer, hepatocellular carcinoma. It may also contribute to progression and invasion of cervical cancer. In addition, recent study has demonstrated increased expression level of miR-92a in osteosarcoma tissues, and its high expression was correlated with clinical stage. Moreover, miR-92a-3p together with miR-17-5p was confirmed to be up-regulated in circulating exosomes of colorectal cancer (CRC) and their expression levels were significantly correlated with the pathological stages and grades of the CRC patients. miR-92a-3p is also secreted by liposarcoma cells through extracellular vesicles and participates in pro-tumoral inﬂammatory process leading to liposarcoma growth in a paracrine manner. In addition, correlation between miR-92a and cardiovascular disease was reported. It has been demonstrated that miR-92a could regulate endothelial dysfunction and atherosclerosis. It has been suggested that high level of plasma miR-92a and endothelial microparticles could reflect the extent of endothelial cell activation and more importantly, that miR-92a could serve as novel biomarkers to distinguish patients with acute myocardial infarction from stable coronary heart disease. Xiao J, Yu W, at al. "miR-92a promotes tumor growth of osteosarcoma by targeting PTEN/AKT signaling pathway. " Oncology Reports 37: 2513-2521 (2017). Volinia S, Calin GA, Liu CG, Ambs S, Cimmino A, Petrocca F, Visone R, Iorio M, Roldo C, Ferracin M, et al. "A microRNA expression signature of human solid tumors defines cancer gene targets. " Proc Natl Acad Sci USA 103: 2257-2261 (2006). Ambs S, Prueitt RL, Yi M, Hudson RS, Howe TM, Petrocca F, Wallace TA, Liu CG, Volinia S, Calin GA, et al. "Genomic profiling of microRNA and messenger RNA reveals deregulated microRNA expression in prostate cancer. " Cancer Res 68: 6162-6170 (2008). Motoyama K, Inoue H, Takatsuno Y, Tanaka F, Mimori K, Uetake H, Sugihara K and Mori M. " Over- and under-expressed microRNAs in human colorectal cancer. " Int J Oncol 34: 1069-1075 (2009). Yang W, Dou C, Wang Y, Jia Y, Li C, Zheng X and Tu K. " MicroRNA-92a contributes to tumor growth of human hepatocellular carcinoma by targeting FBXW7. "Oncol Rep 34: 2576-2584 (2015). Kong Q, Tang Z, Xiang F, Jiang J, Yue H, Wu R, Kang X. "Diagnostic Value of Serum hsa-mir-92a in Patients with Cervical Cancer." Clin Lab. ;63(2):335-340 (2017). Fangfang Fu, Weiqin,Jiang, Linfu Zhou, Zhi Chen. "Circulating Exosomal miR-17-5p and miR-92a-3p Predict Pathologic Stage and Grade of Colorectal Cancer. "Translational Oncology: 11(2): 221-232 (2018). Yang X, Zeng Z, Hou Y, Yuan T, Gao C, et al. "MicroRNA-92a as a Potential Biomarker in Diagnosis of Colorectal Cancer: A Systematic Review and Meta-Analysis. "PLoS ONE 9(2): e88745 (2014). Casadei L, Calore F, Creighton ChJ, Guescini M, et al. "Exosome-Derived miR-25-3p and miR-92a-3p Stimulate Liposarcoma Progression." Cancer Res; 77(14) July 15 (2017). Yuchen Zhang, Junjun Cheng, Fang Chen, Changyan Wu, Junmeng Zhang, Xuejun Ren, Yu Pan, Bin Nie, Quan Li and Yu Li. "Circulating endothelial microparticles and miR-92a in acute myocardial infarction. " Bioscience Reports: 37, BSR20170047 (2017).